Summertime and the grillin’ is easy. Can you hear the song? That is the sweet melody that is played on your patio while the brisket is smokin’ and the beers are chillin’. What? You only have an Hibachi on a cinder block in the back of the yard? OK, that’s fine, but we’re all allowed to dream. So kick off your flip flops, grab a cool one and imagine your very own outdoor kitchen! Let’s equate outdoor kitchens to hamburgers: they come in all sizes, shapes and flavors. For those of you whose mouth is watering and whose taste is champagne while their budget is beer, let’s start with a Slider. Sliders are small, but some of them can really deliver in the fixin’s! Small patio and small budget? Never fear! Get a grill that you can afford plus look like a pro in front of, and get a great little mini-fridge (or two) and put them side by side. Look on YouTube for some easy ways to pull the grill and refrigerators together and put them opposite your house wall, creating a cozy space between the kitchen and the house (plus not setting your house on fire!). I’ve seen some great outdoor kitchens that are recycled wood or stone veneers, or corrugated metal siding and they go over an inexpensive wood frame and give you a custom look. Not handy? Promise your handiest friend a lifetime supply of sliders and their beverage of choice and get the job done! Pull out the patio chairs, put some plants and candles around, turn on the tunes and fire up that new grill! Fire up the Tiki Torches – it’s summertime and the grillin’ is totally within your reach. Make your outdoor kitchen as unique as you are and have fun, not regrets when you look at the Hibachi that is half hidden in the weeds. The All-American Cheeseburger is mainstream U.S.A. Plump, juicy and with sides that take you down memory lane. Traditional, and reliable, this style of outdoor kitchen is what everyone sees in the magazines. A beautiful stainless grill, stainless refrigerator (or two), lots of counter space and plenty of patio to eat and lounge in. 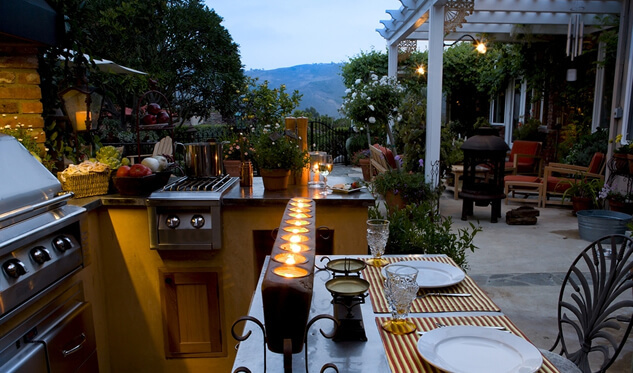 This is a mouthwatering outdoor kitchen with soft lighting, nice furniture, plants and ambiance. Some of these kitchens sport a pizza oven or a smoker and even have a sink and small burners for keeping sauces hot. Mmmm. Lounges, a table with matching chairs, throw pillows and plants and flowers. Dare we say that the good times roll on this patio? Turn on the music and the water feature and put your feet up while the shrimp is cookin’ on the barbie. This kitchen will cost you a little more, but think of the parties, the food, the relaxation and the fun! You no longer have to look over your neighbor’s fence with envy and if you put on a sweater you can sit out there in the fall and spring. In the winter, you can dig out a path through the snow and grill those All-American burgers and drive the neighbor’s nuts with the aroma! Now we come to the Five Star Burger that has been rubbed, massaged, smoked, marinated, brined and handled with kid fire-proof gloves. Oh my! The outdoor kitchen equivalent sits beside a pool with a hot tub and a water slide. The lighting which sits below each plant, palm and flower, are solar and cast lovely, dancing shadows over your patio dining set. Floral arrangements, fragrant, tall candles in gleaming hurricane globes grace the table and several of the patio conversation groupings. POP! Time to return to reality. But wasn’t it fun? Which is YOUR favorite hamburger and outdoor kitchen? We can each create the outdoor kitchen and dining and relaxing experience that we want and can afford. Sometimes an Hibachi is not so bad… at least you can pack it in the back of the car and take it to the beach. Can’t do that with any other outdoor kitchen! Summertime dreamin’ and grillin’. Dream on! It’s not out of reach.